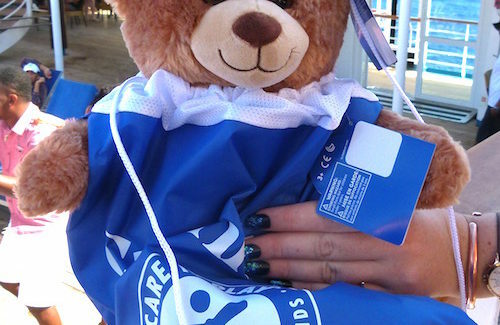 The cuddly teddy bear wearing a Carnival T-shirt that the Florida woman just bought for $25 is for a very worthy cause – St. Jude Children’s Research Hospital. When the Groove for St. Jude event started on the Sensation, the top deck event was packed. 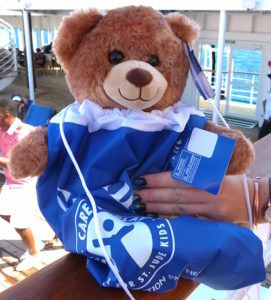 Passengers were lined up to donate and get either a “Groove for St. Jude” T-shirt and a “Care to Play” wrist band or a teddy bear. Since December 2009, Carnival Cruise Line has partnered with St. Jude Children’s Hospital in Memphis to raise more than $13 million to help St. Jude in its fight against childhood cancer. Now Carnival is stepping up those efforts even more. The new goal is the most ambitious one so far – to raise $5 million in the next five years for a total of $18 million. St. Jude provides no-cost care to children from around the world. It also helps families of those children with a motto that no child is turned away because of a family’s inability to pay. St. Jude care and support is free for children and their families. St. Jude has an amazing 80 percent success rate in treating cancer. I grew up watching the “Danny Thomas Show” on our very small screen television at home. He is the comedian who went on to found St. Jude Children’s Research Hospital. As a starving actor, the story goes that Danny Thomas made a vow. If he found success, he would open a shrine dedicated to St. Jude Thaddeus, the patron saint of hopeless causes. The actor never forgot his promise. After becoming famous in the early 1950s, Danny and his wife built St. Jude Children’s Research Hospital. Danny Thomas died of heart failure at age 79 on Feb. 6, 1991. He is interred on the grounds of St. Jude in Memphis. When his wife of 55 years, Rose Marie, died in July 2000, she was buried alongside him. Their daughter, actress Marlo Thomas, is now outreach director for St. Jude Children’s Research Hospital.